Share the post "A Tale of Two Cities: Amsterdam NY"
If you look at the videos below, you will find that they both reflect the City of Amsterdam. So this single city does actually appear to be two distinct cities based upon which video you watch. I think the ensuing debate as to which video really shows the “true city” misses the point completely — they are both “true”. True, we have blight and ruin. True, we have gorgeous homes. True, we have poverty**. True, we have homelessness. True, we have some things getting worse. True, we have some things getting better. Like I posted a while ago when the community had a similar reaction to a film director’s comments that the city appeared “post-apocalyptic”, I feel somewhat the same with this debate — it misses the point entirely. And that point is simply this: things will not change nor will they get better unless you ENVISION something better , unless you CREATE A STRATEGY and unless you DO SOMETHING. Or the flip side: if you envision things only getting worse, resign yourself to that outcome and do absolutely nothing , then things will indeed get worse. Unfortunately for us, we have a lot inertia for the latter and not enough momentum for the former. Yes, both things are true TODAY. The question remains: what will be the true city TOMORROW. That’s the question that matters. And so far, I don’t see many people answering that question at all. **The 2/3 poverty rate cited for the city of Amsterdam in Video 2 is incorrect but yes we have poverty and lower median incomes. 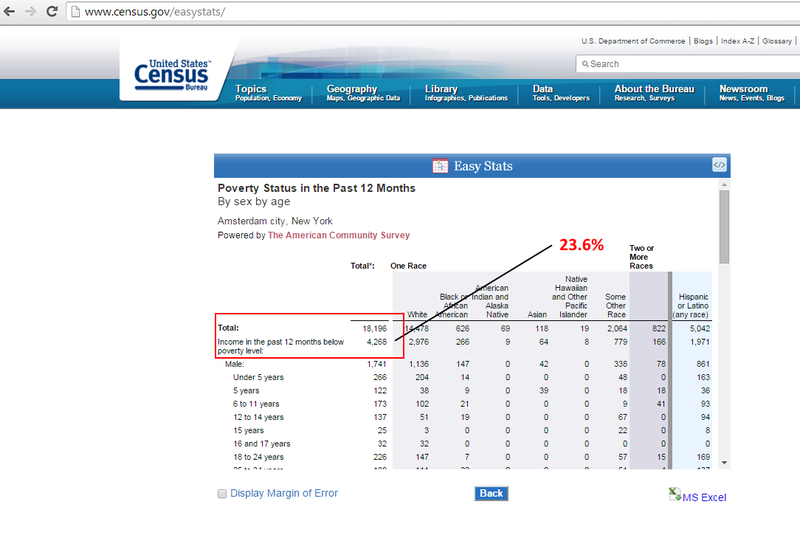 City of Amsterdam Poverty Rate U.S. Census Bureau, 2009-2013 American Community Survey 5-Year Estimates. The Times, Are They a'Changin?